Partially digested Asian Palm Civet beans droppings are then hand collected from where they lay on the jungle floor, bagged, and then processed. This process takes place on the islands of Sumatra, Java and Sulawesi in the Indonesian Archipelago, in the Philippines (where the product is called Kape Alamid) and in East Timor (locally called kafé-laku). Kopi Luwak, also known as caphe cut chon (fox-dung coffee) in Vietnam. The Asian Palm Civet is also known as the Common Palm Civet or the Toddy Cat, is a cat-sized mammal. 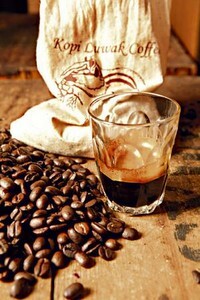 Kopi is the Indonesian word for coffee, and luwak is a local name of the Asian Palm Civet. Kopi Luwak is the most expensive coffee in the world, selling for between $120 and $600 USD per pound, and is sold mainly in Japan and the United States. How Many Years do Plastic Bags Take to Decompose? Previous post: How Many Years do Plastic Bags Take to Decompose?